For many years, G-Star has been a denim pioneer: originating the concept of 3D-denim and dedication to raw, untreated denim. G-Star’s philosophy has always been ‘Just the Product.’ focusing on denim craftsmanship and innovation. 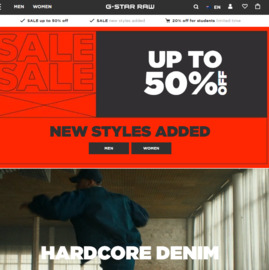 Click Start Shopping to earn 8% Cash Back at G-Star RAW AU.